Over the course of a semester, I developed THIRD STREET into a full-length play, which was recently produced as a staged or “enhanced” reading as part of the Cohen New Works Festival at the University of Texas, Austin. We approached the project through a non-traditional lens. Instead of bringing in pages to read and respond to, with a director and cast and stage manager, we generated gobs of material that I then fashioned into Third Street. Our project was to create a script-building process that was as important as the final product. 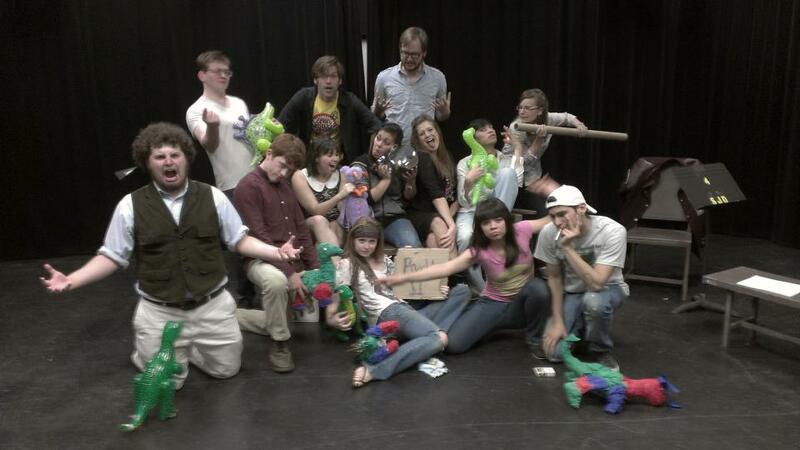 The process, you see, could be used to create a play at a university or high school with a group of young actor folk. The ensemble was key. Ben Hardin directed the process. We cast ten kickass actors. Because we were part of a 40-show Festival, we counted a billion lucky stars that we managed to get the exact cast that we wanted. Because they put so much badass thought work and life into the play, any production of the play will be required to credit these folks in the program. Methinks Third Street would likely be produced by or for high school or undergraduate theatre communities. Possibly middle school. Any place that needs a play for a large number of young folks, looking for something with sword fights, knights, dinosaurs, a dinosaur pinata, and lonely people looking to connect. Shane trains for a Renaissance Faire in a crap-filled alley. The neighborhood tough guy, Otis, comes to him asking for help. He warns Shane that dinosaurs are attacking. Meanwhile, Shane’s younger sister Marie struggles to get into the Bracelets, the popular group. Shane escapes into fantasy. Otis is pursued by his nightmares.